Your opinion matters. 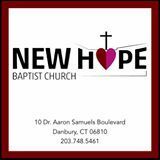 Leave A Review Or Edit This Listing for Community Action Committee Of Danbury - New Hope Baptist Church. The food pantry is located at the New Hope Baptist Church. As a typical example, a family of four receives enough food for three meals for three days or nine meals in total. Access to the Food Pantry is limited to once a month. Required proof of eligibility includes a photo ID and proof of household income for all members of the family. Families with income below 200% of the federal poverty level are eligible to apply for Food Pantry benefits. The number of meals distributed continues to rise as economic conditions in the area worsen. In order to help low-income families and individuals, CACD is seeking both monetary and non-perishable food contributions. The agency's goal is to keep people from being hungry. Monetary donations should be sent to CACD's Finance Director at CACD, 66 North Street, Danbury, CT 06810. We always need more information on our pantries. If you know of any details, volunteer information, website, hours or more description information about Community Action Committee Of Danbury - New Hope Baptist Church please add a comment (below the map on this page), with information. We will then display this for all visitors on this page.